On my group Hypnobirthing & Birth Preparation course in York last weekend we discussed the realities of the Fourth Trimester, something that's not talked about so much. There is so much focus on the birth, that what happen to your body afterwards and its recovery is often not discussed, or seen in our culture. (We just see Kate Middleton 8 hours after birth fully made up, blow dried hair, and no post birth 'bump' at all - VERY much not the norm). So I thought I would do some posts all about the Fourth Trimester, the initial period after baby is born to you feel more informed and prepared about this time as you adjust to life with your new baby. Today we are starting with Lochia. Lochia is the reason you need those gigantic maternity pads in your birth bag. It's the vaginal discharge after giving birth containing blood, mucus, and uterine tissue. And it can be really heavy initially - like your period on steroids the first few days! You have an open wound inside your womb from where the placenta detaches, and a thick uterine lining that needs to shed. It lasts a fairly long time, up to 6 weeks after birth. And if you’ve had a cesarean delivery, you will still have lochia! ~ The first stage can last up to four days postpartum and consists of the immediate discharge of blood, mucus, and tissue. ~ The second stage is a pinkish-brown, watery discharge that lasts up to 10 days after delivery. ~ ~ The last stage of the process is a yellowish white vaginal discharge that can last as long as four to six weeks after the birth of your baby. 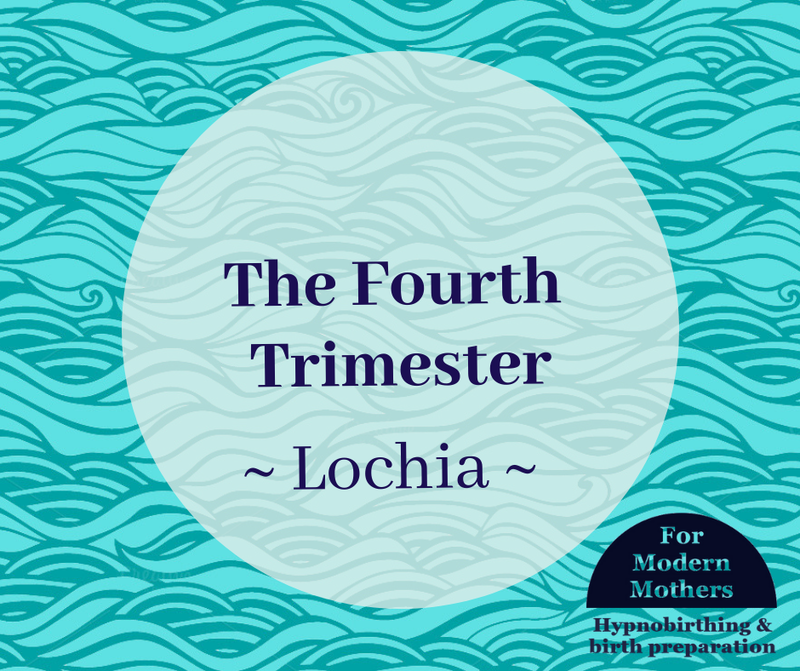 If lochia is green in color, has a ‘fishy’ smell, or you have a fever, it could mean an infection is brewing and you need let your docutor or midwife know. An increase in discharge sometimes happens after sitting a long time for one of those marathon breastfeeding sessions, or with increased activity like a long walk. This is usually not indicative of a problem, but it can remind you not to physically overdo it in those early weeks. BUT the return of bright red bleeding, filling a sanitary pad in an hour or less, or passing a golf ball sized clot (or more) requires you to seek immediate medical attention. You should get more info on this from your midwife, but I think it's helpful to know all this in advance too. And of course feel free to let me know your own experiences and any helpful advice you may for others too.